I want stainless appliances, quartz countertops, a view of the trees, maybe a lofted ceiling—oh, and a sliding barn door. Or maybe a balcony! You’ll find it all at The Carter. With a park for a backyard, this is a four-legged friend’s paradise. 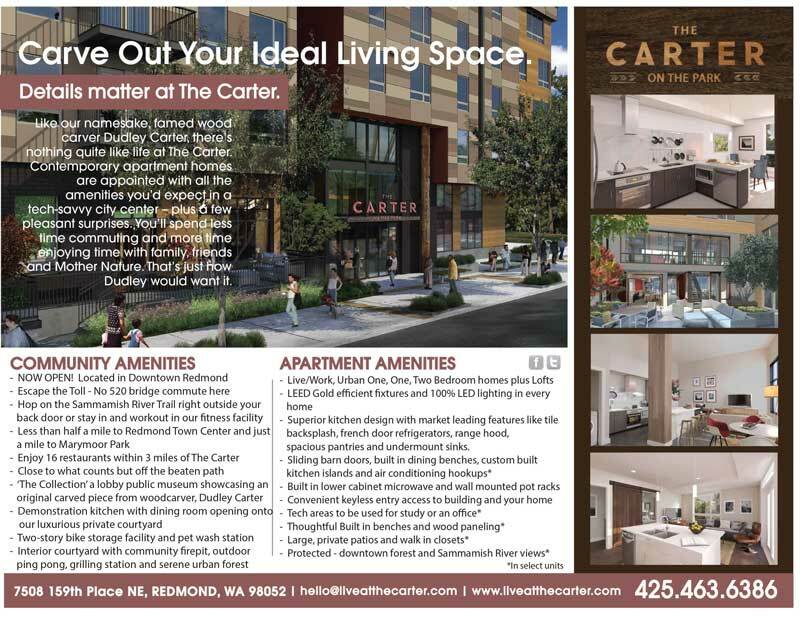 Plus, the concierge service, keyless home entry, controlled access parking, fitness center, serenity garden – and the list goes on. Techie? Dog lover? Shopaholic? Cyclist? Foodie? There’s a lot to love, all within walking distance. From the natural beauty that already exists, to the building progress being made every day – there’s plenty to show-and-tell at our Redmond apartments for rent. Our namesake, Dudley Carter, is a famed wood carver and artist who built a post-and-beam structure in the park just outside our doors.